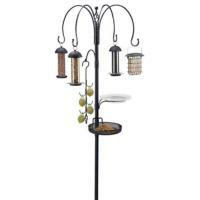 These feeders, which are hard to find, are great for all of the visitors who come to my yard to include Opie the Opossum. I purchased the first one I had 8 to 10 years. The only fault I might mentioned is the ends pop of the frame so I'm headed to Lowes for some metal end caps. Great product, I asked the birds for a testimonial and their response was "This is great, there's room for all my family, cousins, aunts and uncles to eat. 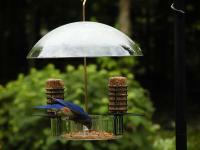 Thanks backyard chirper"
Loved the tray feeder, however, would like to have speed nuts to keep the steel rods on. The first time a squirrel got in it, one of the rods came out and we had feed all over the ground.